finding JOY in the everyday moments of my life! Easter is different this year. Easter is different this year because I am different this year. I'm watching the Scriptures on this Good Friday as they scourge and mutilate, humiliate and crucify the One who has stood by me this past year. The only ONE that has truly walked this path with me, cried tears with me, held me, protected me, moved mountains for me, rocked me gently to sleep and given me strength to wake up and keep putting one foot in front of the other. Him. They are killing Him. It is excruciating. I've never felt it more personally than I have today. God's Giving Me My Purple Back! As long as I can remember purple has been my color. As a child I loved it, by teenage years I was positively obsessed. I cannot begin to count how many purple sweaters, blouses and scarves have hung in my closet over the years. In May of 1992 I walked down the aisle at my wedding to a sea of my best girlfriends, all wearing royal purple. I loved it. The color is rich, majestic, perfect for any occasion and whenever I've worn it, I have felt special. It's my thing. I don't have many obsessions. I've always loved elephants and I think Jimmy Fallon is the bee's knees and everyone who knows me well, knows my color choice is ALWAYS going to be purple. Until October came. Four days in late October I sat and watched my husband of 26 years die. He died of depression. He choose to leave me and our daughter. I will forever search for answers. During those four days, I lost the color purple. There was a moment and then everything in my world changed and moved and I lost. I lost my husband, whom I adored. I lost my hope, my future and my color. Purple was no longer part of my happy. It had become my sad. I've mourned all my losses from that day...the big and the small. Purple was lost. Jewelry got put away, clothes given to Good Will, eyeshadow trashed. All the purple - I threw out of my life. And no one really noticed except my daughter. She did. She noticed every time I chose pink instead of purple, she noticed I never wore purple anything. I couldn't tell her why. I just chalked it up to changes in life. She NEVER believed me. And then God stepped in. Three days ago my facebook daily memory popped up. It was a picture of me, a few years back with my purple-streaked hair. I did it for fun, for a Disney trip with friends, but I secretly loved it and would have kept it that way! The picture of those purple streaks made me laugh and I hadn't laughed about purple in a long time. The next day, I as driving home and admiring the sunset. I noticed something that struck me so much I had to stop. Along with the pink and orange and yellow in the sky...there were purple streaks. Purple! It was beautiful. I even took a picture for proof of the beauty. The One who paints the sunrise and sunset was showing off and showing me purple. Yesterday I walked into the laundry and in the middle of the floor, left behind when my 14 year old did her laundry, was a single purple striped sock. Purple stripe. The 3rd purple strip in 3 days. I might not go out and refill my closet with purple clothing, I probably won't paint a wall purple, or buy a purple car. But little by little, I see purple coming back in my world. It's coming back, stripe by stripe. God's Word tells me that by the stripes of Jesus we are healed. I believe that covers my salvation and my life and my happiness. Those stripes for me, will now always be purple. The majestic, magnificent, mighty God meeting me in the midst of my storm, flashing stripes of purple, whispering "it will be okay again, you will smile again,you will be happy again. You will love purple again. I am bringing it back to your life." Don't be surprised to see a purple streak or two in my hair next time you see me. Now you will know why it is there! Today is January 25th. Most of you are celebrating the end of a work week, start of a weekend or maybe just thinking how could Christmas have already been a month ago - time is flying! I am thinking all those things too, with the additional thought that there are other things I should be doing. I should be planning a dinner with friends and family, baking either a chocolate or carrot cake and wrapping that gift. I should be doing all those things because today should be a celebration of my husband’s 51st birthday. Instead, it is a day where feelings of happiness mingle with sadness and bitterness and I sit here and try to fling grace at all of it. My husband took his life in October. He suffered with depression, mental illness and a severe alcohol addiction. He didn’t think himself redeemable. He was wrong. He didn’t think he could have back the life he loved. He was wrong. He didn’t think he could be forgiven and rehabilitated. He was wrong. I tried to save him. I did everything humanly possible to save him from himself and from the demons that tortured him. I failed. Today, I celebrate the life of a man I loved, a flawed husband and father, but no more flawed than you or I. I am thankful for his life, I mourn his loss and the loss of our future together. This is his day. But I also want to use this day to acknowledge that there are others who suffer as he did. I might be talking about you or one of your family members or friends. I want to encourage you to reach out if you are feeling depressed, feeling like you don’t want to continue your life, feeling like you are unredeemable. Reach out to me if you want, to your friends, or family, a pastor, a counselor - someone. Just reach out. If you know someone who is struggling - YOU reach out to them. Don’t think that it is not serious. Don’t think you can always check on them another day. Do EVERYTHING in your power to reach out to them and offer help. EVERYTHING in your power. You may ultimately fail, but do it anyway. I hope you have a happy Friday. I hope your weekend is great. I hope if you are suffering today, that you will reach out. Throughout the last few months I have been made aware of two great tools to help those who suffer and those who want to help. Text 741741 - this will connect you to a crisis counselor who can help you through the moment. Happy Birthday, my sweet Danny! We are thinking of you today. I have spent the last few weeks writing, reading and praying about grace. It's my word for the year. I think my prayers are working...I seem to be able to apply grace in more and more of the circumstances I find myself in of late. Last week I started a Bible study on Job. Fitting, I suppose...I am enjoying it and it has introduced a new concept to my daily thoughts -- Peace. Peace in circumstances beyond my control, peace when the tire goes flat and the bills pile high and the teenage girl has boy trouble. Peace. How I need it, how I crave it. 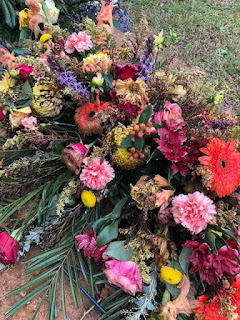 The circumstances surrounding my late husband's final year and the months prior to his death were the opposite of peaceful. The days and nights were filled with chaos and lies, betrayals, horrible, horrible times. I longed for peace. I longed for it for him, for me, for our daughter. I was in a battle against Satan himself and even in places where I should have found peace, there was none to be found, So when I think of peace, now, nearly three months after his death, I think of it as a blessing. A safe harbor, a gift that I was denied, but have been given in the last few months. Having peace does not make all the pain go away; it doesn't mean that all my questions are answered. God's peace is different than that... God's peace gives us the ability to leave all that pain, all those questions, all the hurt and betrayal in His hands. He alone knows all the answers, He alone knows how many tears I've cried, He alone can carry me through this river to the other side where Hope and Happiness and Love wait for me. Peace. I've cried for it, I've begged for it, I've worked for it and finally I've learn to just accept it and live in it. (but that's a work in progress for sure!). The excerpt I've included at the bottom of this post is from a book of devotions I use each morning. These two paragraphs have done more to help me heal in the broken spots in the past few days than just about any therapy session or friend or prayer time or crying session. They are truth...I cling to them. Living Happily in the Moment! "Real, sturdy, lasting peace, peace that doesn't rise and fall with circumstances, isn't to be found in picking apart your life until you have underscored all of the components. You will never understand it all because God, for your good and his glory, keeps some of it shrouded in mystery. So peace is found only in trust, trust of the One who is in careful control of all the things that tend to rob you of your peace. He knows, he understands, he is in control of what appears to be chaos, he is never surprised, he is never confused, he never worries or loses a night's sleep , he never walks off the job to take a rest, he never gets so busy with one thing that he neglects another, and he never plays favorites. You need to remind yourself again and again of his wise and loving control, not because that will immediately make your life make sense, but because it will give you rest and peace in those moments that all of us ace at one time or another - when life doesn't seem to make any sense. " If you've spent any time at all in a church...you likely know these songs...and many more like them. Both traditional hymns and contemporary songs speak of grace. God's grace. His infinite capacity to bestow undeserved favor and mercy on us. For a few days now I have searched my heart, the scriptures and the Lord through prayer for a word for the year 2019. I'm not one that goes in for a list of resolutions to check off at the new year, I mainly just try to keep living like I have been, striving to become more like the woman God would have me to be in the coming year than I was in the last. But this year, this year, I need something concrete to hang on to. In the months before my whole world changed, I sat and talked with a friend about grace and how much I needed it to overcome feelings and hurts that had been thrust my way. My friend spoke of how grace had been used in his life, how he had relied on God's grace to see him through a traumatic time, how he had seen God working through him to use grace as a tool to forgive those who had hurt him, and in doing so helped him to move forward in life, past all the hurt. Grace. Unmerited favor. Simple, sweet, easy to accept...hard to give away. I knew after that conversation I needed to embrace the action of grace in my life with my own hurts and those who had disappointed me. I needed to let God, through His grace, change my way of thinking, my way of living. I needed to extend the grace I had been so wonderfully given. A few days later I came across this sign in a home decor store and immediately bought two. 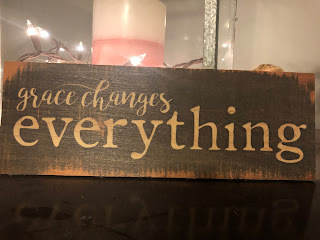 I sent one to my friend as a thank you for his sharing of the grace truth with me and kept one as a reminder to myself that grace does change everything...it starts with changing me. I look at this sign every day - one of the first things I see every morning. I have clung to this sentiment, perhaps more than any other in the past few months. At first I had hope it would help how I dealt with my husband and our life together. I think it did...because no matter how life turned out - grace, God's grace was evident in all the matters between us and between him and the Lord. But now, I look at the sign and know that it is still something to hang on to. Grace still changes everything. I struggle with pain and disappointment. I struggle with betrayal by trusted family members. I struggle with forgiving those who hurt my husband, who seemingly don't know or care to make amends. I struggle with the questions that have no answer, the loss of dreams, and the realities of this life I didn't want, but now have in abundance. All of this helps me cling to grace. Grace is my word for this year. I need God's grace to overcome and change me from the inside out. I need His grace to change everything. It was the worst of times and the worst of times. 2018 started off bad, got worse and ended with horror. "Fear not, for I have redeemed you; I have called you by your name, you are Mine. When you pass through the waters, I will be with you, and through the rivers, they shall not overflow you. When you walk through the fire, you shall not be burned, nor shall the flame scorch you." I texted those words to our friend and twenty minutes later he took his life. My husband spent the day trying to make sense of this loss. Later that night, lying by his side, I was trying to help him and it dawned on me that maybe those words had been for my husband instead. It was my husband who really lived the trauma of that day -- perhaps the Lord wanted him to hear those words...so I shared them with him that night. Hoping it was of some comfort. Three years have passed, and my husband did not recover from his friend's suicide. He fell into depression and alcoholism and never recovered. He never let himself be comforted, never let himself move forward, and two months ago he followed his friend and took his own life. I still cling to the words of Isaiah. I still claim them, I still feel like those words were meant for both my husband and his friend. I feel they have worked in my life as well. The word of the Lord is living and breathing and it is a comfort to me. As the year has been drawing to a close, I have been looking to God's Word for comfort, for inspiration and a hope for the future. Some might think it a coincidence, I chose to believe that it is God, once again, confirming to me that He is with me, He is for me, He is working all things out to good, He is going to see me through the fire, without a scorch, or a smell of smoke. How do I know... that same chapter, chapter 43, in Isaiah, just a few verses down from the above verses...there's a promise for a new year. Read it for yourself, claim if for yourself. Live it for yourself and your family...God is here, God is present, God is in all the details of your life. I know. "Do not remember the former things. Or consider the things of old. Behold, I will do a new thing. NOW it will spring forth, Will you not know it? I will make a road in the wilderness and streams in the desert." Here's to a road in my wilderness and water in my desert...and the same for you and yours in 2019. My husband has been dead for 57 days...57 ... his favorite number - 57 Chevy Belair - his favorite car... 57. The picture above is our daughter. Our Joy - our everything. She can crack my heart wide open with that smile of hers. She doesn't know how beautiful she really is, she is caught in the world of 14 year old girls who don't know their real value and worth, only see their imperfections and straining to bust into the "real world" sooner than it is quickly coming to them anyway. This is actually the second picture I took of her tonight. We were at a friend's home, surrounded by laughter and fun happening all around us, and I looked up and saw her from across the room. Tall, thin, wild hair, beautiful smile, she just took my breath away. I picked up my phone (some of y'all might can guess what happened) to take a picture and my first thought was to send it to her dad. Not unusual for us to be separated at parties like this, during the holidays due to his work schedule, so it was just a natural reflex to want to take a picture and send him that image of his girl... and then it hit me. I couldn't do it. He wouldn't get it. His phone is uncharged and in the closet. It was the loose chink in the armor I had built around my heart for this night and for tomorrow. I crumbled. That's what my life is like now, moments of strength followed by moments of senility, followed by rational thoughts and finally a flood of tears. I know it will get better, but tonight, in the stillness of my house, alone with my aching heart, I am having trouble sensing the peace I so loudly proclaim as my gift from God through this mess. Pray for me tonight, pray for me tomorrow. I don't want to wallow and I want to move past..it's just so hard, so hard, so hard. I love facebook… have since the day I first joined. All my friends live there, my photographs, my memories,funny conversations, cute videos, all live in my fb account. I am guilty of checking in far too much each day, posting things that I am sure make people crazy, using it to boast and brag on my youngun, snicker at other people, guilty of it all. I’m saying that because I am about to throw stones and I realize it is at a glass house… I am guilty of doing the stupid on the site… but what I do try to do is be real. Honest, transparent, based in reality --REAL ! I’ve let me emotions run wild at times, probably said too much MANY times...but I live my life on FB the way I try to live my life in RL...open, clear, honest and pointing people to Christ. I am writing this morning as a Christ follower and a wife who is grieving her spouse. Not a perfect spouse, not a perfect man, not a perfect father, a REAL, flesh and bone, good, bad, troubled, happy, sad, caring and indifferent, at times sweet and other times unkind man who fought demons and finally lost. A man who is dead. He is in a box, wearing clothes I chose for him, cold as ice, six feet (so they tell me) under the ground. No air, in the dark, wasting away back to the dust… that’s where his human carriage is located. It’s a sweet place, a place he actually picked out for us all to have our final rest. He lies with my mom and his friend, someday my dad and me. If I want to kick him -- I go there and kick some dirt. You can too - stupid, stupid, boy! BUT -- he’s not really there. He went to heaven… I saw him go. I was holding his hand and then I tried to hold his spirit in by putting my head on the top of his… for just one more second of life. But he went. I believe he was escorted to Heaven like all of us who believe in the saving grace of Jesus, (and he did!) I believe he was brought to Jesus, I believe he worshipped him right then and there, I think he is still doing just that… I believe it to be so, I have read it in scripture and scripture is truth. Scripture is TRUTH. It is God’s word, it is living and breathing. It is relevant, it is worthy of heeding because it is TRUE. Not much in this world is true. News is fake, internet is baloney, people you think you could trust lie and and conspire against you. Satan is out killing and destroying people and families and TRUTH is hard to find. Except in the Bible. It's all true...all you have to do is READ it. God will help you understand it . And if that happens….then this can be avoided. Finally here --- this is what I want to say this morning. These memes on Facebook, the ones that mean well, the ones that people like to share...especially at Christmas. They are the devil’s work. They may be pretty and the sentiments might be nice but Christian friends… please think and investigate before you share a meme about people in heaven. Contrary to the two most popular ones I’ve seen/been sent, this month….my husband is not going to come down on Christmas day and sit at our table for dinner. He is not looking down and seeing how sad we are, he is not hearing the carols being sung or played on WAFJ (well, he would be tuning into to a KICKS 99 - the country station -- but still). He is not sending us love from heaven, or a present from heaven, or flying around in the form of a bird. Although I have a fondness for the red bird because it is a sweet reminder of loved ones -- but I have NEVER once thought it was really my mom or Danny who were out there pecking at the bird feeder. It just is not happening. My well-meaning, Christ believing sisters and brothers who share these memes… please look to the word of God for your memes. Scripture makes a much better sentiment. You see, it is not comforting to me to think that Danny is in heaven and yet still so tied to this awful earth that he sees me and Hannah. That he sees our pain, hears our conversations, comes and sits in a “ghostly form” at the dinner table. WHAT????? NO! Absolutely NOT! Danny is in HEAVEN-- with JESUS. It’s heaven. He AIN’T thinking about us anymore. HE IS WITH THE LORD. THAT is ALL the comfort I need. Just to know that he finally is calm, his addiction is gone, all his questions answered, his struggles are over. He is where I long to be, and trust me - when I get there -- I will not care what you are doing, what songs you are singing, what gifts you are opening and what the heck you are eating for Christmas dinner. Don’t save me a place, I won’t be there. I will not be at the bird feeder, I will not be tuning the heavenly radio trying to get a good signal… I will be with the LORD. And If I look back, it will only be to see if you are following me to Heaven and I will see you with perfect eyes...so I will know how the story ends...I will not be sad...I’ll just be cheering you on until you get where I am. Think before you post - check out what God says. I completely get non-believers making this mistake...but my believer friends and family should know better. I expect you to know better, I implore you to know better. I appreciate the sentiments -- I know people mean it as comfort….but REALITY is much more comforting. God is much more comforting. Thinking my dead husband is hovering around my Christmas tree...NOT comforting! This is one of the last photos my husband and I took together. Odd, I know. But believe it or not, this is one of my favorite pictures. We have had a lifetime of photos. Good ones, bad ones, flattering, unflattering, fun, sad, happy, angry. For sure, we documented our life. But this one... this silly picture I snapped as we laid on our bed watching tv is precious to me. Feet. 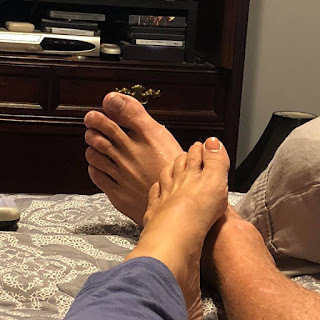 Just the feet of two people that loved each other. No matter what-we did love. We were (I still am!) stubborn. Both of us. We fell in love a long time ago and through some really good times and some really BAD times, that love was always there. I'm no expert - but I have learned a thing or two over the past two and a half decades. You really can't destroy love. You can test it, try it, bend, stretch it out of shape. You can try and run from it, you can be so angry that you forget it for a moment. But destroy love...no. Can't do it. It is no secret that we had trouble. More than our share. We fought, we got hurt, we hurt each other, we did enough to destroy our love...if it could be destroyed. But God! God put us together and with Him we stuck together. Those feet always found their way back to each other. We were joined together a lifetime ago and only death ripped us apart. Secret plans of the Enemy didn't do it, lies didn't do it, anger didn't do it, alcohol didn't do it, really bad decisions and really foolish choices didn't do it. We were always together - even when those feet were apart...love held us together. I adore that picture. Toes and feet, mingled together --just like our two lives mingled together, he ended and I began, or I ended and he began. Sometimes it was hard to figure out. I can't count the number of times we watched tv or talked until dawn in this way...it was our thing. I'm so glad I snapped this photo the last time we were able to do this. Somehow, it is more intimate than I really feel comfortable sharing. HE LOVED ME and I LOVED HIM. It was that simple. So this picture, taken a few weeks before he died, let's me know that no matter what - the love was still there and for me -- it will always be there. Yesterday was the mark of one month since the Bad Wednesday. The day he choose to end his life by suicide. I will say that hitting the one month mark was surprisingly traumatic for me. I haven't functioned well, not yesterday,not today. I have been snippy, snotty, aggravated, and the resolve to find purpose as I have wished in my former posts has gone out the window. Today I was sent a text by someone I love dearly extolling my virtues of coming through this time so well. I literally sat in my bed (it was 2 PM!) and laughed until I cried. Today I am so the opposite of her sweet words. I can't find my God today. I can't find my joy in all circumstances today. I don't have any inspiring quotes or thoughts in my foggy widow's brain today. Today I woke up and watched Netflix until I felt like such a loser that I got out of bed and took a shower. That was so exhausting that I immediately climbed back into bed and continued my Netflix and chill day. Where was my child you may ask? Home, here with her sorry excuse of a mom. She was combing the cabinets for something to eat, showering on her own and tending to the animals. I just couldn't do anything. I felt heavy. Overwhelmed with emotion and I couldn't even separate and name the emotions...they were just "ON" my person. I guess I am due this time. This let down, this momentary grief episode. I just feel bad for giving in. Although as I just typed that I realized I didn't give in...I was literally run over by it...with no option but to lay there and let it roll over me. I make Facebook sad on days like yesterday and today and I'm sure I've made some readers sad with this post. But this is my honest place. You come to visit here and you will get all of it...good,bad and ugly! This morning I opened up my Facebook and was immediately shown my FB memory of the day. You fb'ers out there know what I mean. Everyone else...well, Facebook selects a random post from that day from your past posts on that day and shares it with you. You can share it with the world again or just revel in it quietly to yourself! Today's memory was a statement I wrote on November 19, 2013. It was just me participating in the trendy "write something you are thankful for EVERY day in November or the Thanksgiving turkey will be dry" kinda post! Today I am thankful I serve a BIG GOD! And you know what - on that day - I am sure I was. I am positive I meant every word. I am not the kind to be fake - any time, any where. I'm pretty transparent. I had NO idea how big God was at that point in my life. I had a relationship with Him. I was striving to do my best to serve Him, love others, be a good wife, a good mom, a good employee - heck - I even worked at the church just to ensure my priorities were all in the right place. But was my God really that big back then though? I had seen Him work a miracle or two. I had a little girl living in my home that came to be there ONLY by His hand - no denying that...so He was big enough to accomplish that in my life. But really - otherwise - I didn't take much note of His EVERY DAY working in my life because my life was typical, maybe like yours if you are reading this. A happy family, loving parents, happy marriage, stable home life, roof over my head, food on my table, friends, lunch dates, play dates, movies, music, clothes, ALL the comforts. ALL the things that make us safe. I was that daughter, that employee, that friend, that mom, that wife, THAT person. Active in church, serving at church, know all the words to the songs - could sing even if the power went out and the screens went blank. THAT was me. Loving the Lord, but not really KNOWING HIM. Today, just five short years later - I am COMPLETELY different in most every way. About the only thing the same in my life is the little girl is still here - only now she is a teenager with dreams and plans all her own...most of which do not include me! The daughter that I was, well, I buried my mom in 2015 and I have lost my dad to dementia. I am basically an orphan. No parents. The employee that I was, well, I am no longer working. I'm searching for a job, for a paycheck, for stability. The friend that I was, well, that's changed to. I used to be the one that pulled everyone else together. I would listen and counsel and be there for all my dear ones. The stable, happy example that they could look to for strength. TOTALLY different now as I find myself with NO strength and see in every direction a dearly loved friend reaching out to help me - in so many ways. I am completely dependent on them. Completely! 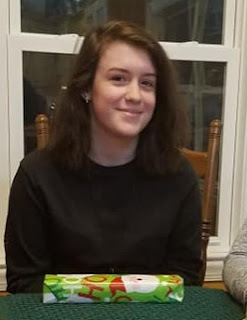 The mother that I was, well, as I said - I am now a mom of a teenager girl. It is a scary path and each day is a new adventure. I am not as sure footed on this parenting thing as I used to be and I once was just one of her parents. Now I am the ONLY one. The wife that I was, well, that is gone too. I am no longer anyone's wife. I am single. I am widowed. I should wear black for a year and never hope to have any more fun in life. I don't have a man to share my life with, to fix things, to change the oil or the light bulbs. I don't have mounds of male laundry, no one to cook for, support, love, hold hands with in the dark or mingle my feet with while watching tv. I am alone. But do I still consider myself thankful for a BIG GOD? Yes, I am thankful for a Big God. But I know it now at a deeper level. God has shown me a snippet of His love for me. He has given me a quick glimpse every now and then through the past month of just how much He is doing for me. He reached down on October 24th at 9:00 AM and picked me up. He hasn't put me down yet. I have left no footprints since that morning, not any where on this earth. Not here,not Texas, not anywhere. My BIG God is carrying me... He is even bigger and stronger and more loving that I could have imagined five years ago. So today, I can say it again and mean it even more. So thankful I serve a BIG GOD! This verse has been rattling around in my heart for a bit of time. I've never really known why, something about it just appealed to me...appealed to the part of the me that is stubborn and refuses to give up hope. You see, for months I have been trying to beg a miracle down from heaven. I've had hope and lost hope over and over. That's the way of life when one loves an addict and deals with their addiction. I've used this verse as a deposit for the future, when my beautiful, lost husband would find his way back from the darkness and home to all our goodness...in the land of the living. Now, I view this verse totally different. Yesterday was a cold November rain kind of day. I spent time in the presence of utter darkness and evil. I found myself in the physical place where my husband made his last REALLY bad decision. I found the shambles of his life, remnants of our life and pieces; vile, disgusting, ugly pieces, to a puzzle I will never get to completely put together. This place, this physical location could be a visual snapshot of his inner turmoil. Lost, alone, shattered, filled with chaos, stale, sad, uninhabitable. The darkness that had kept him trapped for so long, that darkness that engulfed him on the Bad Wednesday, that darkness called out to me. It taunted me, tripped me, struggled with me and tried to trap me like it did his sweet soul. This was no special effect in a Hollywood movie, this was real. My mind raced last night as I thought about the events of the day. My mind settled when I thought about this verse. I had experienced darkness and destruction in the land of death BUT I was rescued. I was pulled back. Two of my dearest friends patiently, cautiously, lovingly helped me walk back into the light until I saw the goodness of the LORD, literally, in the land of the living. I wish the same had been true for my husband. His struggle with the dark ended differently but his struggle is now over. He is home. He is safe. He is experiencing the REAL goodness of the LORD in the land of the EVER-living. Because of that I sleep blessed tonight, as I have every night, since the Awful Saturday. This I know...no matter what your land of destruction or your darkness...I beg you to claim this verse - be CONVINCED that you will see the goodness of the LORD...because you will. Nineteen days ago, my 50 year old husband died. He should be alive today. He should be making plans to come home for Thanksgiving. He should not be in the ground, covered with sprays of flowers that are decaying above as he does below. He should be here with me, with our daughter, with our pets. I should be angry that his jeans are starting to pile up in the corner and at his inside out socks strewn across the floor. I should be irritated at his snoring while I struggle to hear the vapid conversation of the two characters on the latest Hallmark Christmas movie. He shouldn't be. He should be. We should be. I shouldn't be. I just want to scream "what the HELL happened to my life?" Welcome to my new/old blog. So far it must be a cheerful respite in your Internet scroll. I apologize in advance - far in advance, because I do not see this rant ending any time soon. I used to blog. One thousand years ago. It was a sweet time in my life. I was a new mom, in love with my husband and our sweet little life together. I was quite literally "happy in the moment". My worries were few, my troubles faded quickly and though there were of course highs and lows ... life was good. Life was, dare I say, Great! I blogged faithfully, good days and bad, charting my child's cute milestones for all to enjoy. I blogged about fun things that happened at work, make-up, food, current events. I splayed my happy moments out for all to see. It fulfilled me --- I loved sharing. Until I didn't. My last post was about my mom and her unexpected death. It was too painful to enter this blog after that day. I was raw, cut and bleeding and scrambling to make sense of such an enormous loss. 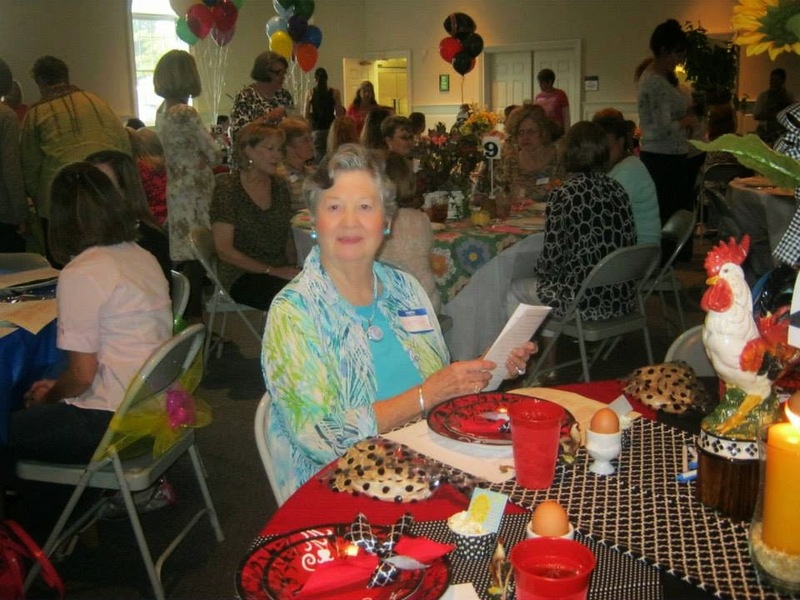 My mom loved to read my blog posts...I had no choice but to close up my little "happy corner of the blogsphere." Did I mention that nineteen days ago my husband died? Truth needs to be told here so I will be able splay myself open for all to see and hope for some good to come of this mess that is now my "new" normal. My husband, 50 years old, made the devastating decision to end his life by suicide. That is his story to tell. I am here to tell mine. To climb through the clutter and make a new life for myself. To wallow and cry and moan and groan and hopefully show you how I grab hold of the feet of Jesus. How He is dragging me from the rubble of my former life to the new life I know He is already preparing for me. Thanks for coming on this journey with me. I believe that in the by and by, we can all be "happy in the moment" once again. I had lost interest in blogging, had no time for it, life was too busy, grief was too strong... lots and lots of reasons. The list could be endless...but then Tuesday. Tuesday happened and I woke up with a desire to blog again. I know, I know - you guys have heard it all before....and I am not going to say I will be here every day - or even every month... but truly - I do want to come back. So - today - I am back. Good to see ya! How've you been? Today marks the one month anniversary of my mom's passing. The words are few that I have to offer today, but I do have some words. I have changed so much, my life has changed so much and although there are days that I feel pretty confident in my ability to carry on with life sans my momma, there are many more days that I wake up feeling fragile and shattered, much like a window through which a baseball has been thrown from the hand of a careless child. On those days, my brokenness is so tangible I can almost feel the wind blowing through the shards. For the past month, many times I have questioned "why?" Wondered out loud and to others why this happened. Guess what ....it happened so I would not rely on myself but on God. On His deliverance. That my hope would be set on Him for that continued deliverance. It was such a comfort to me... I just can't begin to tell you what this did for me. It raised me up from sorrow...put me on the forward path of HOPE. I was headed there -- but now I feel like I am really on the right path after all. Hope---- Hope--- Hope!!! I am hopeful today...sad, but hopeful! Living HOPEFULLY in the moment! The one good thing about having a blog...I can leave and return whenever the inspiration hits. The only downside to this is that I don't know if I have any readers left out there... but if I do...YAY -- here's a blog post!!! I have often said I wanted a nanny cam so I could see what these two do during the day while we are all at work/school. I think it is safe to say that my viewing would be quite boring. The day was delightful for me, quite healing and by the time school let out - I was rested and restored and ready to spend the afternoon doing laundry, cooking dinner and helping out with 5th grade homework. Now it is Tuesday and since I was feeling so good and ready for the day, I was immediately called about five minutes after I got to work to come get my sweet girl - she was feeling bad! Once again I am happily entrenched on the couch - enjoying some tv time. A co-worker mentioned that The Voice was on last night - I missed it, so I decided to check it out today thanks to ON DEMAND! The first contender was a woman from Nashville - who can SING, ya'll. I did notice something in her outfit that looked quite familar...I took a screen shot -- and compared it to a photo I had...see if you can see it..
Harlan is hoping Sarah wins...he likes her style! Living happy in the moment! Sometimes late at night, when all the world (or at least my little corner of it) is fast asleep, I tiptoe to the kitchen...and make cornbread. There! The secret is out. I am a late night cornbread baker...and subsequent eater. Cornbread ties me to my home. It helps anchor my overwhelmed mind in the solid soil of my childhood memories. It stakes me to the land of my birth, to the ties that bind, to the warm shadows of my past. My Aunt Nell made cornbread. My Uncle Nate ate cornbread. My brothers consumed it for dinner and supper and I learned to eat it sitting at the table with all of them, legs dangling off the chair pulled up to an oversized plate, a tall glass of tea and a plate of cornbread, turned upside down. Cornbread, soft, moist, crunchy on the outside if it is done just right. Slathered with butter, or syrup if you know what is really good. Cornbread, a staple at the table, every meal but breakfast. Cornbread heaped with beans, or chicken, or made into a the most sumptuous dressing on Sundays and Thanksgiving. So, often on nights like this one, when I am tired and overwhelmed by the busyness of my life, I creep into the freshly cleaned kitchen, pull out my great grandmother's mixing bowl (reserved only for baking biscuits and cornbread) and start combining corn meal and eggs and milk and butter. The real butter, not the fake stuff. I break out the cast iron skillet and melt the shortening. Pour in the creamy mixture and wait. Twenty minutes most nights, and I am comforted by the corny smell, the browned bottom of the bread as it is flipped out onto a plate, upside down. I cut it into triangles and suddenly, as if in a time machine blasting backward years...I am home. Sitting at the table, legs too short to touch the floor, filling my plate with cornbread, tasting the crumbly goodness as I listen to all those people I love tell tales around my aunt's dining table. Home. Cornbread takes me home...everytime. WHEW! I got into the author's section of my blog. I was scared for half -a-second that I would be asked a password and then it would be all over. It has been a year since I have been here. A password search of my brain would do me in at this point in my life. September has turned into quite the eventful month, after 11 relatively unremarkable ones, I finally feel as though I have somthing to contribute to the blogsphere. First of all, my baby, MY BABY! turned 10 ! Where has that time gone? I am constatnly floored with the changes in her little life. 5th grade, Safety Patrol, 4-H Officer, so grown up, so grown up, so grown up! So, my baby turned 10 and I went to my 30th high school reunion. Yes, you read that correctly - 30th! I am actually proud of the number. Considering about 12 of my classmates didn't live to be there - I am happy and proud to be able to say I was in attendance. I think I will do a whole post on the 30th, so let's just say here, it was a good evening...interesting, VERY interesting! September is tooling along, Fall is on our horizon and I am so happy to see it come. I started this blog in the fall about 9 years ago....so Happy Blog Birthday to me and those of you who have met me here over the years. I will not make a silly promise to be back here often, become more fully committed to writing and all the other yada yada stuff I have written in the past. Every day is hard for me -- but evey major event might be a more reasonable goal to shoot for and achieve. Raising a tweenager is becoming harder and harder... people - no one warned me of all this!!! AGHHHH!! So - in an effort to promote some good solid character qualities in my child of the 2000's....I have started the Thanksgiving Project. In 2010, after a tumultous two years of rediscovering myself as a mom, a wife, daughter and friend (you could pretty much say that I failed at each one during that time!!) I came across a book by Ann Voskamp called ""One Thousand Gifts." If you haven't heard of it or read it - I REALLY encourage you to - no, seriously --- run to the store....I will wait! Okay - glad you came back. The premise of the book is simple and yet oh some complex! Thankfulness - thankfulness for all we have, all we see, feel, taste, touch, give, accept, put out into the world is the KEY - the KEY, people....to JOY! Not just "happy dance" kinda worldly joy -- but true PEACE and JOY!! The kind that only God can give, the kind that only comes from a heart too full of being grateful to hold onto grudges, sin, sadness, envy -- just a grateful heart with the spaces filled in with JOY! The book changed my life. I started looking for ways to be happy, to be thankful for even the smallest thing in my day -- to change my outlook from WHY ME? to WHY NOT ME? To shake the cobwebs off, to realize the blessings I do have and let go of the what if's that plagued me for far too long. I want more for my daughter. I don't want her to have to face questions and regrets and sorrow until she can't stand up and then turn to try and find purpose and joy. I want her to catch it on the upswing of her life, to know the secret years before she even knows she needs to find the answer. On November 1st, she and I started a new Thanksgiving Journal. She is really into journals with cute picture of puppies on the cover and writing and cool pencils with glitter and sparkles. I am more interested in the inside of the pages. Pages where each day, she and I take a few minutes to write three (or more) things that we are thankful for that day. It is amazing to watch. She is getting it...she is turing her thoughts to gratefuless and realizing the joy in the small. I am proud as punch to see this character trait developing. It tops the list on my pages --- everyday! The Thanksgiving Project...well worth the time this holiday season in our home -- for certain!! We change jobs, homes, clothes, minds, seasons, cars, shoes, and bed linens. We change money, light bulbs, phones, tires and oil (can you tell I live with a "car guy" from those last two items?). Change is necessary…sometimes it is fun and exciting, like the change of season or a new home and sometimes it is scary or sad. Change for me came on a day this past year as I sat in my church preparing for worship. Little did I know that by the end of the day, a new course and direction for me and my family had been charted. As the morning announcements scrolled along the screen, an advertisement for a position as a receptionist and administrative assistant in my church’s office scrolled into sight. My husband, that Car Guy, confirmed my initial reaction and told me that was me and that I needed to speak to the office administrator, now, not later. The Car Guy has long wanted me to work closer to home, long wanted me to have less responsibility at work, (he equated that with less stress at home for some reason!) And he saw the benefit as did I of working and serving the Lord at our home church. I took some thought and prayer on the matter and began the application process. There are tons of details here that would be glorifying to God and yet boring to you the reader so I will not write them all, but please know that at the conclusion of the process, I could not have been more convinced that it was truly the hand of God moving me into the new position. Even though it was painful, He has birthed something new and precious from the anxiety and anguish of that initial decision to step out in faith. So, a month ago change occurred in my world. Now, when I travel to work, I spend six minutes in the car, if my child needs me, I am seven minutes away from her and her 4th grade classroom. I can work at her school in the morning before my job starts. I have two hours in the afternoon to make dinner, clean house, dust, vacuum or as is more often the case, catch up on a television shows and cat nap. My work load is significantly decreased and I am able to focus on my work duties at work and my home/mommy duties at home. What I lost in salary has more than been retrieved in time. Time, and not just time, QUALITY of time. No more texts at strange hours, phone calls to discuss work on off time, no more bringing home work to do after my child’s bedtime. No more rush, rush, rush. No more traffic – unless you count the occasional tractor that makes my drive time go from six minutes into ten. Life has slowed to a wonderful pace. I live AND work in the country now. I do my shopping on the internet, I make a run “into town" once a week for perishable groceries. Life is good. Change has been good. Peace has come to my mind and I am hoping to be back at the art of writing with a much more steady pace. Happy in the Moment…now even happier enjoying more of the moments! The Lord gave me a beautiful sky this morning on my drive in to work. It was the sun in all its glory --- just beautiful. I had my Travis Cottrell worship music jamming on the stereo and the beautiful sunlight bathing me. It was church from the driver's seat...I love mornings that start that way! The highway curved and the sun was gone. Well, of course it was not really gone, I had turned a different direction. My soul starting pouting. It literally felt like all the glory had been sucked out of my drive. The bliss I had just been enjoying was just..gone. I knew the sun was still in the sky and still beautiful, it was just not shining on me anymore. I was blessed to be able to see the visual image and how it applied to my day, my week, the past few weeks, the future weeks to come. You see, just like the pretty sunrise, the warmth and happiness it gave me, so goes my normal life. I am pretty content, happy, joyful and generally try to find the postive in situations more often than the negative. I trudge along, living my life, enjoying the comfort of happy relationships, and not too many challenges. I know God is real, I see His handiwork, I feel His presence. And then the road I travel takes a curve, much like the highway did this morning and my way is suddenly dark, dreary and the "light" is seemingly gone from my world. Troubles come, arguments happen, stress and worry abound. It is in those times that I have to remember that the SON is not gone. He is still there, I have moved, turned from the direction of His light on my life. Even when I can't see or feel His light -- it is still there! Here's to lessons learned on the highway to work...and many more sunrises seen through my windshield! Blessings in a Paper Bag! Blessings come my way in the most unexpected times. Sometimes I miss them, today I was lucky enough to see one! I arrived at work to find crisis after crisis...it was starting off all wrong and let me tell you - days that start off wrong here in preschool world...never seem to end! Just as I was settling into a day of unexpected twists and turns, the best one came along! That's right -- nectar from the gods (aka Coke!!) and the most delicious appley turnovery frittery type pastry I have eaten in a long time! Did you catch that - she stopped by for no reason other than to share this treat with me. It amazes me how God works in our lives...even to the smallest detail. You see, I didn't have time for even a bite of breakfast this morning, not even a sip of my famous "Coke of the Morning." We woke up a bit late, had to rush out the door and without even have change for a Coke from the vending machine today, I was going to have to settle for a water bottle and some left over Cheezits at the bottom of my purse! And then...God brought me breakfast (and lunch - cause this pastry is HUGE!!) and a much needed dose of caffine...in the best possible way...my friend, walking into my office! I am blessed by great girlfriends! Not too many days ago we celebrated Dr. Seuss at my little preschool workplace. It was great fun, lots of chances to play dress up (I will spare you the pictures of me dressed as Cat in the Hat!) and lots of fun preschool activites and art projects. One of the highlights of each work day is that we get the opportunity to meet in the hallway for devotion and prayer with our teachers. Dr. Seuss week was no exception - and our devotions that week all centered around a Dr. Seuss quote for each day with a parallel scripture. It was a fun challenge trying to match the two and coming up with a devotion thought. I decided to share some here on the blog-so - wherever and whenever you are reading this...just pretend it is Dr. Seuss week and picture me with a tall, red and white striped hat and red bow tie! Our quote for the day...UNLESS! Now, just think what a challenge this was to match with a verse! And no fair using a Bible app. Here is what I came up with - Psalms 127:1 - "Unless the Lord builds the house, the builders labor in vain. Unless the Lord watches over the city, the guards stand watch in vain"
It was a top of the head moment,and the devotional thought as applied was simply this...we should do all to the glory of God.,every day, all our work and efforts centered around Him or we might as well not do anything. If God is not involved - all is worthless endeavor. That goes for teaching a preschool class of three yea olds, running an office, keeping house, washing the dog, making breakfast, helping with homework, working in a ministry at church, paying the bills, and yes even building a house! God has to be in the center, so we can be in the center of His will for our lives...it is a simple thought - but a big one! It is hard to remember, even harder to live out most days,but oh, so worth it when you see the result of His hand in the details of your life. Here is your Tuesday challenge...live the UNLESS! Put it into practice in your day today - live each moment knowing that UNLESS God is involved in your thoughts and actions - you might as well just stop, go home, get in bed and pull the covers over your head...UNLESS! Do you see it? Can you tell what this is? Let me enlighten you -- it is my Bible...on the floor of my living room. It has been there all week. Anyway...I left the Bible in my spot as the show ended and bedtime ensued. I meant to pick it up -- just didn't get back there that night, and as it turned out - not the next night, or the next one or even the next. My Bible has sat in the same spot all week. As I finally found the strength to tidy up the living area and pick it up, it struck me...that my whole family has been tripping over God's Word each and every day of this week. His scriptures have been under our feet, catching us and we tramped through the house, causing us to stumble and right ourselves again and again. What a word picture. That is exactly how He has worked in my life - over and over again. Placing Himself in strategic points in my path, either through people, or circumstances or yes, even His Word, causing me to stumble and fall on Him, find my peace and my rest and continue on my way. I was tempted to not move the BIble out of our way, tempted to keep it there, indefinitely, to be a visual reminder to myself and my little tribe of our need for God's Word in the midst of our life. My mother will be glad to know that my housekeeping better judgment took over and I did move it - placed it on the table by the couch for more investigation at the next Hollywood feature, but the image of the Word in the middle of my floor has been forever blazed on my mind's eye. God's Word...infalliable, alive and active! People Who Actually Take the Time To Read Me! WAS I REALLY GONE SO LONG?